218" x 123.6" x 95"
Need a Room to meet with clients? No need to redesign your existing space. Panoramic™ Rooms from our Exhibit Component collection are a perfect solution. Save time, save money. Incorporate a Room that goes with anything! Our Exhibit Component collection was developed by seasoned exhibit space designers. The collection reflects universal solutions that would work well alone or with existing exhibit spaces. With seamless SEG fabric graphics, your walls will have all the character of hard panel walls with the added warmth and comfort that fabric can convey. Add Counters, Towers or Walls and you can create an entire exhibit space entirely out of our Exhibit Components collection. Meticulously detailed 3D wireframes are great for designers to wrap your design on so that you can visualize what your exhibit space will look like once it's brought to life. Download the generic CAD file and render a 3D view to concept your exhibit. These cad files are for concept use only. Adjustments may be required on the true structural versions. 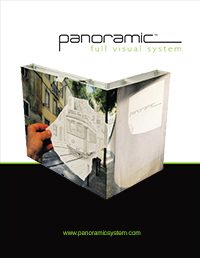 Check out our downloadable Panoramic™ brochure. A great starting point for the Panoramic™ full visual system and easy to share with your customers who are new to the product.